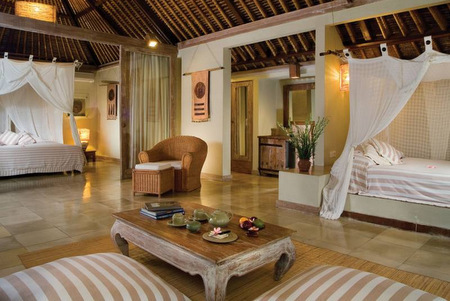 From the Lanai Room to Di Ume Suite with decking that stretches over the agricultural panorama, to stunning villas with private pools overlooking the natural beauty, this is an oasis of calm in a serene setting. 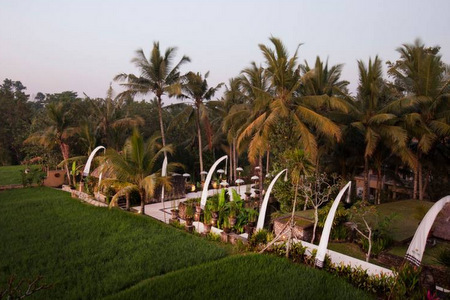 The existing 18 units are carefully constructed around the rice fields that provide such an epic backdrop have been augmented with 15 new units extension built on the opposite bank of an idyllic river. The extension brings more of the rustically designed and natural-feeling room, featuring sunken baths, to a delectable choice of villas with private pools. 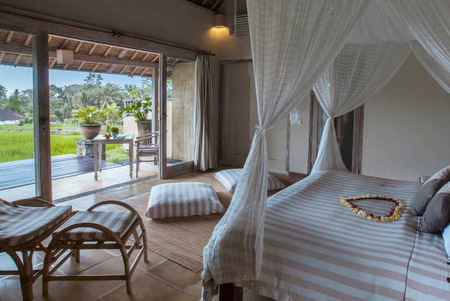 Every facet of Wapa di Ume oozes sophistication, with top-class facilities and fittings, exceptional service as standard and a host of added extras, including yoga lessons, rice fields walking tours, open air theatre and Balinese cooking lessons. 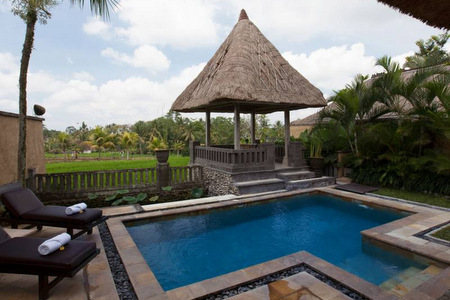 Indulge yourself, relax in the cooling shade beside the temple-like swimming pools adjacent to the panoramic rice terrace gives you an opportunity to feel the cool breeze while lay down on pool chair under the shade of palm trees. 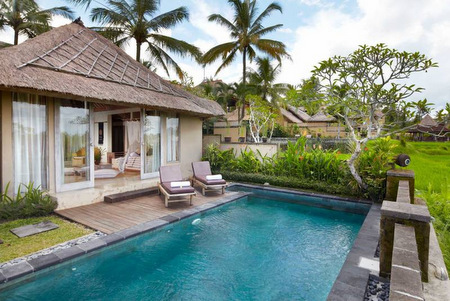 Feel the sounds of the waterfall from the upper level infinity pool while sunbathing or reading books. 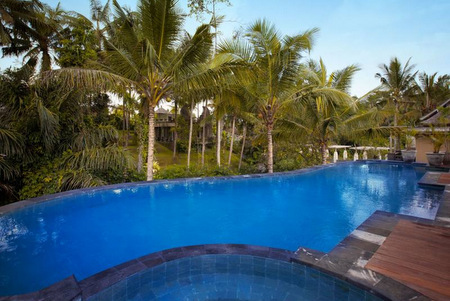 A two levels swimming pool adjacent to the panoramic river gives you an opportunity to feel the cool breeze while lay down on pool chair under the palm trees. The upper level is for children with 0,5meter deep and the lower level is for adult with 1,2meter deep. Enjoy the light meal, reading books or bathing that you can do in this area. 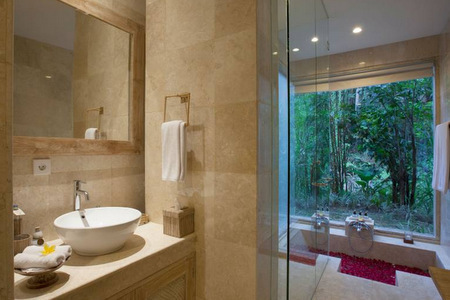 The water is salty, keep cool either in the day surrounded by tropical coconut groves. 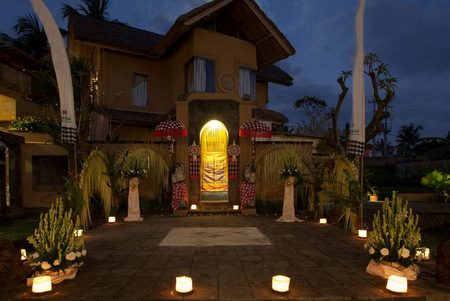 On your holiday in Wapa di Ume, you can have a unique experience of traditional Balinese cooking with a cooking experience. 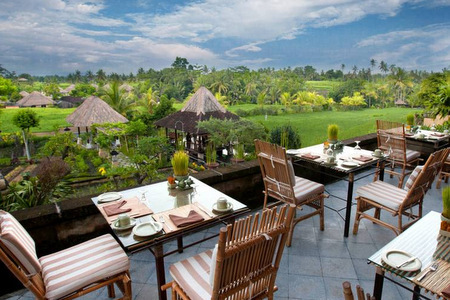 The Balinese chef will guide you to prepare for the cooking, starting at 07.00am in the morning you will be taken by the staff to buy the cooking ingredients at Ubud‟s traditional market. It is also an opportunity to see the Balinese way of life in getting their daily need at the market and to watch how they do bargaining. 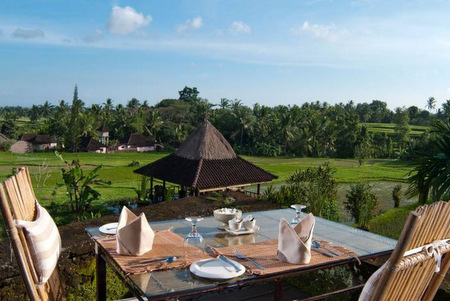 The cooking starts at 11.00am and is held in a traditional Balinese kitchen compound amid the organic gardens and rice fields.